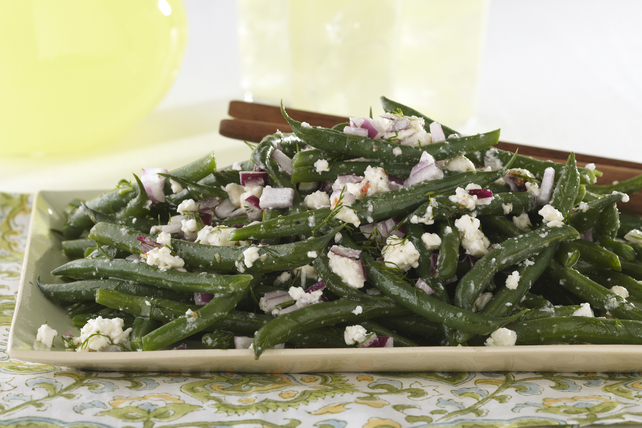 Red onions and chopped dill are added to this tasty green bean salad, along with chunks of feta cheese. Cook beans in boiling water 5 min. or until crisp-tender. Drain; rinse with cold water, then pat dry. Place beans in large bowl. Add remaining ingredients; mix lightly. Prepare as directed, cutting all ingredients in half. Makes 4 servings. Salad can be made ahead of time. Refrigerate up to 4 hours before serving. This great-tasting salad can be part of a healthful eating plan.